To sell good quality reliable products in the UK one must find and work with the top level manufacturers. Because of this we pay a little more and work with a limited number of suppliers. As a result we can be proud of what we offer, and have confidence that we will always meet our customers’ expectations. Most sit on top kayaks are made from LLDPE (Linear Low Density Polyethylene). There are kayaks made from other materials including HDPE, from a few specialist brands. Those who claim their lower-cost sit on kayaks are made from HDPE may be ill informed. There are different grades of LLDPE plastic. The grade used in the manufacture of GoSea kayaks is one of the higher qualities available. It resists UV damage and has excellent memory properties. It costs us more and it is worth it. The thickness of hull a hull’s surface ranges from 3mm to 5.5mm. Where there are sharp angles it will be thicker, and flat surfaces will be about 3.5mm. The temperatures applied to the mould together with the speed and number of rotations during manufacture are critical. Achieving this requires skill and experience. GoSea kayaks avoids the use of rivits. Metal fittings are marine grade and will not let you down. A 3-meter kayak will float with 140kg on board but it may be unstable. Our weight limits are realistic and have been fully tested. Single, Two Person or Tandem, and Two Plus One. Solo or multi person kayaks? Tandem and 2+1 kayaks are very versatile because they can be happily paddled with 1, 2 or 2 adults plus a small child or even the dog! Tandems have three seating positions front, middle and back. So if you are paddling solo, you can sit in the middle seat giving good sideways balance. Tandem kayaks actually paddle very well with one person, providing plenty of glide due to their length and buoyancy. Getting a tandem on and off the car roof rack and down to the water is however, far more difficult than handling a single kayak. What is your weight, size and your levels of ability and confidence? 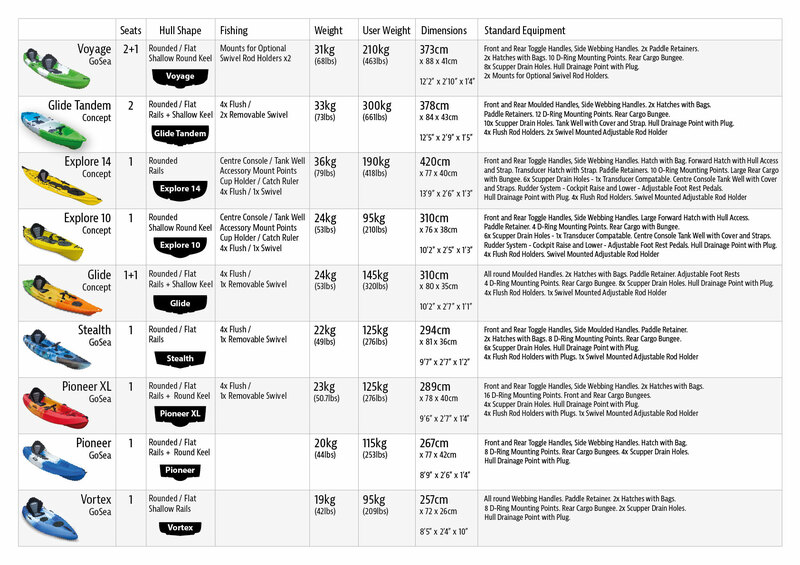 The maximum user weight shown on all our listings and on our comparison chart is a guide to help you choose the right kayak. It will show you the maximum load the kayak can take, including the weight of yourself and any kit you carry. The closer you get to the recommended maximum, the lower the kayak will sit in the water. This will affect stability, manoeuvrability and glide. The height of a person – particularly the length from the waist upwards, also plays a part in stability, as this height affects the centre of gravity of the kayak. Ability and balance of the user. Someone who is experienced, has good balance in a kayak and is confident on the water will be less affected by any reduction in stability due to the kayak sitting lower in the water. To summarise, if you are getting close to the maximum weight, are tall and are new to kayaking, you will need a larger, more buoyant kayak. Where will you be using your kayak? Rivers - Rivers come in many forms. They can be calm and flat, rough, fast, slow, narrow, wide, deep, shallow and many combinations of these. As a general rule, sit on top kayaks are excellent for slower, calm rivers and canals. If you want to get into white water kayaking but are new to the sport, you should consider getting in touch with a local kayak club who can usually offer some training and advice. Whatever type of river you are on, you should remember that water changes its characteristics constantly, both on top and underneath the surface, so always wear a kayaking helmet, buoyancy aid (PFD) and use a paddle leash. Lakes - Lakes usually mean you will be travelling some distance, so a kayak with good glide and comfort will be important. Remember you will quite often be further away from dry land than when kayaking on either the sea or a river. It may look calm and peaceful, but you could be far away from effective help, so always wear a buoyancy aid (PFD) and use a paddle leash. The Sea - There is a very important difference between sheltered, inshore sea kayaking and going offshore. Kayaking in sheltered waters is a great way to gain experience and have lots of fun. Sit On Top kayaks are far better suited to inshore waters than offshore. Kayaking offshore should not be undertaken without specific training, local knowledge and the right equipment. Again always wear a buoyancy aid (PFD) and use a paddle leash. What activities will you be using your kayak for? Surf kayaking - Many of our kayaks perform fantastically well in the surf and provide lots of fun. Manoeuvrability is a big consideration in the surf as you need to react quickly to a constantly changing environment to remain upright as long as possible! Stability is also very important, as kayaking in the surf is by far the easiest way of ending up in the water. Always wear a helmet intended for kayaking, a buoyancy aid (PFD) and use a paddle leash when surfing. Touring - If you are travelling a long distance you will need a kayak which has plenty of room and capacity to carry the extra kit you will want to take. It will also need to have excellent glide, so you will use as little paddling energy as you can, to travel as far as possible. Big, long kayaks can be tiring to get on and off the roof of the car and down to the water if you are only going for a series of quick paddles. However, if you are keen to do some miles, then a big kayak with plenty of room is the best option. Fishing - Stability and space for your gear are the two main features you need in a fishing kayak. Most of our kayaks will be fine to do a spot of fishing if you attach a rod holder, but if you are serious about fishing from your kayak and this will be its main use, then you should go for one of the bigger dedicated models. Many people go for tandem kayaks for fishing as they offer a great amount of cockpit room for your kit and catch if you are paddling solo. Understanding some of the basics about kayaks and kayaking will give you a good insight into what type of kayak you should buy. Glide and tracking - This is a very important feature in a kayak if you are going on longer trips along the rivers, creeks and estuaries. Good tracking (straight line pointing) and glide (travelling with momentum) means you use much less energy paddling. Usually, the longer the kayak, the better it will travel in a straight line. There are however exceptions to this rule and hull design can play a big part in how well a kayak tracks and glides. Manoeuvrability - A big consideration if you are intending to use the kayak in the surf. Usually, the shorter the kayak, the more easily it will turn. Smaller adults and juniors may find the longer kayaks difficult to turn - this can become very tiring. The shape and design of the hull will also play a big part in a kayak's ability to turn quickly and easily. Stability - The stability of a kayak is based on a range of design and load factors and is very important for some activities such as fishing, or for people who are not fully confident on the water. Usually the wider the kayak, the more stable it will be. Whilst this is generally true, certain hull designs have excellent stabilising features whilst remaining relatively narrow. Stability can also be seriously affected by the user's weight and height, so getting the correct size of kayak for you is important -particularly if you are new to kayaking. Please check the recommended loads against your own weight.